"Jacko" the chimpanzee is the oldest exhibit of the Museum of Natural History in Paris. It was probably captured in Angola around 1740 and presented to Buffon who was surintendant of the Jardin du Roi. It remained alive for a short time - presumably it is the "orangutan" described by Diderot in Le Rêve de d'Alembert as in the Jardin du Roi "under a glass dome". 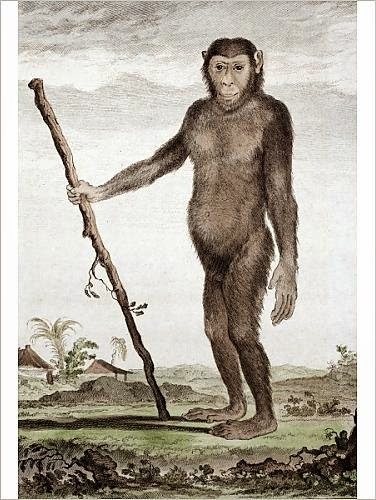 Chimpanzees were very rare in Europe at this period; in 1641 the famous anatomist Nicolas Tulp dissected one that had been kept in the menagerie of the prince of Orange, and identified it as an "orangutan" (meaning "bush man" or "forest man" in Malay) This became a generic name for the known great apes with much resultant confusion. In his Histoire naturelle Buffon distinguishes two sorts of orangutan - "pongos"(derived from an early description of a gorilla) and "jockos"(chimpanzees). The Dutch anatomist Petrus Camper who systematically dissected several genuine orangutans from the Dutch East Indies in the 1770s, pointed out Buffon's errors but they were only corrected in the posthumous editions of the work. The specimen bears the hallmarks of 18th century taxidermy; it is actually stuffed with straw. When Petrus Campus visited Paris for the second time in 1777 he was shocked to observe that the infant chimpanzee had been turned into an erect adult with a walking stick. The museum also has the chimp's skull and a few other bones. The conservator on the TV programme agrees that its DNA could be reconstructed; but to what end is not entirely clear.